What Else Can I Expect from an Online Doctorate in Educational Administration Program? Educational administrators oversee a school's daily activities, help coordinate the curricula, and manage teachers and other school staff. Many students who pursue a Ph.D. in educational administration go on to careers as principals, district leaders, or educators. They handle the politics of running a school, including meeting with superintendents, legislators, and community members to request funding for school programs. Depending on the size of school, other duties may include hiring school personnel, analyzing data, and handling teacher development. Principals at larger schools usually have staff members who handle these responsibilities. A Ph.D. in educational administration will prepare you to work in education. Many doctoral programs in educational leadership prepare students for educator positions and to perform research at the collegiate level. Programs cover topics in academic affairs, student development, financial affairs, faculty development, management, legislation, and ethics. Graduates enter the workforce fluent in examining the organizational, political, social, managerial, interpersonal, and technical dimensions of schools. It's common for students to enroll in an online program, as most are adult learners already employed in education. Programs require five years of teaching experience on average, and a master's degree. It's common for programs to have a leadership aspect since common careers include director of student services, director of instructional technology, principal, and other director positions. Based on information from the Bureau of Labor Statistics, graduates can expect to make over $80,000 a year. Yes, most Ph.D. programs in educational administration are meant for current teachers and educators in leadership positions. Most programs require at least five years of teaching experience. Many work experience requirements are met when students complete their master's program. Pay attention to the length of a program, the specializations offered, and any on-campus requirements. If you're interested in obtaining a K-12 certification or a focus in Christian ministry, then make sure they are offered before applying. Some programs require on-campus residencies or intensives, which can make earning a Ph.D. difficult for adult learners. You should also know where you want to end up in the long-term. Students who aspire for leadership positions, like dean of academia, will need to accrue experience as a college professor first. CAN I WORK WHILE I COMPLETE MY ONLINE MASTER'S IN EDUCATIONAL ADMINISTRATION? Yes, and since many students are already established in a career, most programs will try and work around your schedule. Online programs provide the most flexibility and are the most popular option for students who wish to continue working while in their program. Most degrees require students to earn around 90 credits at a full-time pace, which takes over three-years. Part-time educational administration degrees are also offered, but they are rare. WHAT ARE THE ADVANTAGES TO EARNING MY Ph.D. ONLINE? Given how extensive doctorate programs are, the biggest advantage to earning your Ph.D. online is the flexibility. Many educational administration online degrees are asynchronous, allowing students to study and complete coursework at their leisure. Distance learners are also generally able to complete their internship requirements close to where they live, instead of having to commute to their school's physical campus. Based in Berrien Springs, Michigan, Andrews University has a rich history dating back to 1874. As the first institution of higher learning founded by the Seventh-Day Adventist faith, the school combines Christian leadership with world-class online doctorate programs in education. Andrews’ EdD/PhD programs in higher education administration offer students rewarding opportunities to earn advanced credentials that prepare them for careers in research, teaching, educational policy leadership, policy analysis, and a range of upper-level administrative positions. The EdD program is recommended for students looking for executive-level careers in education administration, while the PhD option is better-suited to students with strong interests in research and teaching. Both programs are structured around a minimum of 16 credits of core courses, along with concentration areas, cognate areas, and research electives. Students in both degree options are required to complete dissertations, which are divided into a two-credit proposal development workshop and a 14-credit final project. Carson-Newman University’s online doctor of education in administrative leadership program helps students develop advanced skills in theoretical analysis, which can be applied in a range of educational settings. Applicants must have completed a master’s and/or EdS degree in education-related fields. Graduates can pursue licensure opportunities in the state of Tennessee, and successful EdD candidates are immediately eligible for the Praxis Leaders Licensure Assessment (SLLA) examination. Those who pass may then be recommended to the state of Tennessee’s Beginning Administrative License (ILL-B) program, leading to further career opportunities in education administration. Located in eastern Tennessee, the university is a historically Baptist liberal arts institution, and counts multiple state governors, federal senators, congresspeople, and university presidents among its alumni. It holds advanced accreditations, including official recognition by the National Council for Accreditation of Teacher Education (NCATE). East Tennessee State University offers online doctorate programs in education in three specific concentrations: administrative endorsement, postsecondary and private sector leadership, and school leadership. The administrative endorsement specialization is recommended for students seeking careers in executive-level institutional administration, while the Postsecondary and Private Sector Leadership concentration is ideal for candidates who want flexible credentials with a wider array of job opportunities. The School Leadership EdD program leads to career paths in K-12 schools, community colleges, technical schools, and four-year undergraduate colleges and universities. Tuition rates are calculated on a credit-hour scale, with all students in online programs qualifying for the same discounted “e-rates.” The Johnson City, Tennessee-based college is part of the nation’s sixth-largest public education network, and has earned accolades for providing outstanding value for the relatively low cost of attendance. Online programs use a combination of synchronous and asynchronous learning, and all online students also qualify for one-on-one tutoring through the university’s Center for Academic Achievement. Located 40 miles south of Chicago among a scenic 750-acre prairie, Governor State University offers highly regarded online doctorate programs in education through its EdD in Interdisciplinary Leadership degree. Students can choose from four specific concentrations, including Higher Education Administration, P-12 Superintendent, Not-for-Profit Social Entrepreneurship Leadership, and Public Safety Leadership specializations. All four concentrations provide advanced training in subject areas including communication, finance, globalism, planning, and research, helping students develop multidimensional skills and broad, inclusive perspectives. Courses are delivered in a hybrid format that combines online learning with traditional classes, and conclude with a capstone project chosen by the student. The program requires a minimum of 60 credits to graduate, with 33 of those coming from their chosen concentration. The EdD in Interdisciplinary Leadership is ideal for working professionals looking to upgrade their educational credentials while enjoying the school’s tight-knit community. Hampton University’s online PhD in Educational Management prepares students for high-level education administration jobs. The program runs on an accelerated schedule, in which students are required to complete 66 credit-hours in one of four concentrations. Available specializations include: Higher Education, Pre-K-12 Education, STEM Leadership, and Special Education. Leadership skills are emphasized across all four degree concentrations, making graduates highly qualified for executive-level positions at all institutional levels. Doctorate degree candidates also benefit from direct links to an extensive network of successful professionals and professional organizations. Admission requirements include a minimum undergraduate GPA of 3.0, as well as a minimum GRE score of 150 along with a written statement of intent, two letters of recommendation, a resume, official transcripts from all previously attended schools, and, in some cases, an in-person interview. Financial aid is available to qualified students through federal, state, and school-specific programs. Please consult the school’s state eligibility list before applying. Founded in 1865, Indiana State University is an independent, publicly funded institution. Considered one of the top schools in the American Midwest, ISU allows students to pursue a range of online doctorate programs in education, including an innovative PhD in School and Educational Administration. Candidates complete a minimum of 72 credit-hours, and benefit from the school’s highly regarded reputation for public service in their post-program career paths. Alternately, students with a special interest in careers at postsecondary institutions can opt for the PhD program in Higher Education Leadership. Both options use blended formats that include classes, practicums, and independent learning. The school’s main campus is located on a 200-plus-acre property on the northern side of Terre Haute’s central business district. Students in online education PhD programs enjoy full access to Indiana State University’s world-class Cunningham Memorial Library, which includes access to more than 1.3 million books, journals, periodicals, and research resources. Sam Houston State University is the state of Texas’ oldest educational institution specifically designed for the training of teachers. Just 50 minutes from downtown Houston, Sam Houston State University offers a Doctorate in Education online program in Developmental Education Administration. It is one of the most esteemed programs of its kind in the United States. The EdD program in Developmental Education Administration prepares participants to help meet the needs of underprepared students who are enrolled in programs at the community college and university levels. It emphasizes the importance of research while helping candidates develop comprehensive skills for promoting the sustained intellectual and educational growth of challenged students. Online students are paired with mentors, who deliver hands-on assistance through various media including specialized advisement sessions, telephone, and electronic formats. Students in the EdD Developmental Education Administration program are also required to schedule at least three in-person meetings with their advisors each calendar year, with a minimum of one meeting in each of the spring, summer, and fall semesters. Home of the Aggies, Texas A&M is home to the largest college student body in the state and one of the largest in the country. The school’s beautiful 5,200-acre main campus is located in the city of College Station, and is home to the prestigious George Bush Presidential Library and Museum, which is one of only 14 such institutions in the United States to be administered by the National Archives and Records Administration. Students seeking online doctorate programs in education may apply to Texas A&M’s EdD program in Curriculum and Instruction. This course of study is designed to prepare students for leadership roles in public and private P-12 schools. It uses a cohort structure to deliver course materials using an online system, and typically takes four years to complete. The EdD in Curriculum and Instruction is specifically designed to help candidates develop skills in three key areas: discovery, knowledge application, and leadership. Applicants are required to have at least five years of professional teaching experience as well as a master’s degree. A minimum of three letters of reference must also be submitted, along with customized writing samples in areas that test the applicant’s current knowledge of educational and instructional topics. Texas A&M’s Commerce campus is situated in the northeastern part of the Dallas-Fort Worth metropolitan area. 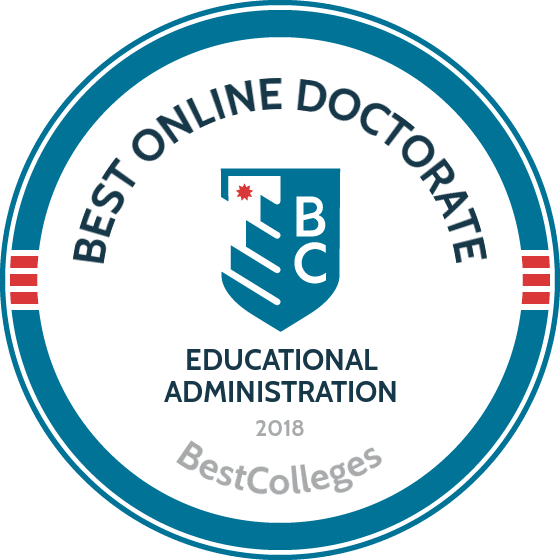 At the Commerce campus, students looking to complete a doctorate in education online can choose from three programs: the EdD in Educational Administration (100% online), the EdD in Higher Education, and the PhD in Educational Psychology (both more than 50% online). Texas A&M University-Commerce holds voluntary membership in the National Council for State Authorization Reciprocity Agreements (NC-SARA) program, an independent organization that provides comprehensive quality assurance oversights for distance learning initiatives that use digital platforms. The school was previously known as East Texas State University, and joined the Texas A&M network in 1996. The EdD in Educational Administration program places a strong emphasis on leadership skills, with special priority gives to issues of diversity and inclusion. Graduates are highly qualified for a broad range of education administration jobs at all levels of study, in both the public and private sectors. Graduate-level students and working professionals seeking access to better jobs in education administration can pursue two degree options at Lubbock-based Texas Tech University. The school’s EdD in Higher Education Administration is available in two concentrations. First, the Community College Administration stream prepares candidates for executive-level positions at junior colleges and community colleges. Alternately, the College/University Administration stream takes a distinct focus on four-year colleges and universities that offer both undergraduate and graduate programs. Both programs use a blended delivery format. All coursework can be completed entirely online, but on-campus attendance is mandatory for new students, who must participate in an orientation workshop. In addition, students in the program must take part in three in-person summer sessions designed to accelerate their professional development. The program takes approximately three years to complete, and includes one in-person professional development session per calendar year. Applicants are required to show a direct, personal connection to higher education, and full-time professional work experience in a junior or four-year college is strongly preferred. Based in the historic city of Gainesville, the University of Florida offers one of the most innovative online doctorate programs in education in the country. The school’s Leadership in Educational Administration Doctorate (LEAD) program leads to an EdD degree designation, and is one of the Kellogg Foundation’s first Community College Leadership Programs. The innovative curriculum helps students draw meaningful links and parallels between practice and research, and prepares students for high-level jobs in education administration. The University of Florida’s doctorate-level education programs have historically taken a focus on two-year community and junior colleges, but the College of Education has recently adopted a broader mandate to include four-year undergraduate institutions and nonprofit organizations with a strong post-secondary focus. The LEAD EdD program uses a hybrid format, with most course materials and assignments being delivered online. Virtual learning is supplemented with a limited number of in-person sessions, held in a rotation that covers three weekends per academic semester. Students in the program are also eligible for financial assistance in the form of fellowships, grants, and loans, which are administered through the UF Office for Student Financial Affairs. The Tennessee-based University of Memphis offers one of the most unique programs available to students seeking to earn an education administration degree online. The EdD program in Instruction and Curriculum Leadership - Instructional Design and Technology takes a specific focus on how current and in-development technologies are shaping, and will continue to shape, the delivery of education. Each student’s course load, assignments, and projects are customized to meet individual research interests, and students complete a total of 54 credit-hours to qualify for graduation. In addition, the program is delivered on a flexible schedule that can be designed to limit students to a maximum of two courses per semester. This makes it ideal for working professionals looking to upgrade their educational qualifications. The EdD in Instruction and Curriculum Leadership prepares students for high-level education administration jobs in corporate training, professional development, research, human resources, assessment, educational technology, instructional design, and more. The degree can be completed entirely online, and uses a cohort structure that pairs students with like-minded colleagues who have similar research interests. The University of Nebraska-Lincoln offers one of the nation’s leading programs in education administration. Jointly offered through the University of Nebraska-Lincoln and the University of Nebraska at Omaha, the Educational Administration: Specialization in P-12 Educational Administration EdD program leads directly to a superintendent endorsement. It is recommended to education professionals with a master’s degree or higher who want to move into district-level leadership positions. This program is delivered in a blended format, combining virtual learning with a dissertation orientation during the first fall semester after enrollment. During this orientation session, students will join networking groups and sign up for on-campus seminars, which are offered during the summer semesters. Courses in the program are designed to meet Interstate School Leaders Licensure Consortium Standards, which offer a proven path to advanced career opportunities. As the state’s oldest university, the University of Nebraska-Lincoln also offers a desirable pedigree as the largest single institution in the state’s public higher education network. Residencies are often required. Students must hold a master's degree in a related field. Many positions require in-state licensure, which includes an exam and post-degree training. Employment opportunities are strong for those in educational administration. Enrollments continue to rise as a postsecondary education becomes a standard for every worker. This increase in enrollments means that colleges and universities have more students and therefore a greater need for administrators to serve those students. Compensation is also improved by attaining a Ph.D. in educational administration. According to the Bureau of Labor Statistics, the median salary for an administrator was roughly $88,000. However, it is important to note that most educational administrator roles are found in colleges and universities, where the median wage for the same roles is actually closer to $91,000. Educational administration degree holders have strong job prospects going forward: The Bls projects that the economy will add 270,000 positions in the field between 2014 and 2024. Most careers in the industry are keeping pace with, or exceeding, the national average growth rate of 7%. The average career growth rate for the above careers is 37%. Curriculum developers experience the highest career growth with a 54.5% increase, but make the third lowest salary between the five positions. Special education teachers experience a growth rate of 47.6% and head teachers 41.6%. Postsecondary Administrator: This is a catch-all term used for teachers, faculty members, and other personnel at the college and university level. These administrators oversee student services, academics, and faculty at their institutions. Common positions include deans, registrars, student administrators, admissions officers, and faculty researchers. Postsecondary Teacher/college professor: With a Ph.D. in educational administration, graduates have the credentials to work as professors in colleges, universities, and community colleges, as well as at technical and trade schools. Additionally, many professors conduct research at their institution. K-12 Principal: K-12 principals are responsible for managing all school operations at elementary, middle, or high schools. They supervise all daily happenings and are sometimes have assistant principals who assist with school administration. Duties include management, budgeting and finance, discipline, teacher evaluation, and curriculum approval. Instructional Coordinator: Instructional coordinators are responsible for developing, evaluating, and implementing standardized curricula at all grade levels. They work with teachers to ensure students are learning the material and assess the effectiveness of the curriculum. Instructional coordinators are often required to have state licensure. It's important for students and professionals to make professional connections and to learn about different approaches to education. Professional organizations provide this, as well as a wealth of resources and knowledge about different career paths. Below are three established education organizations that host networking events and provide online training, job boards, and other services. The National Educational Association: The NEA is the nation's largest professional employee organization with the goal of ensuring that public schools provide all students with a quality education. This is accomplished by advocating for education professionals and by providing a variety of resources and grants on their website. The Association of American Educators: The AAE is a non-union professional organization for professional educators that is focused on student achievement above all else. This nonprofit provides benefits and services, like liability insurance and scholarships, for education professionals. This gives teachers peace-of-mind so that they can focus on educating students. National Association of Secondary School Principals: NASSP provides school leaders in 35 different countries with networking opportunities, continuing education programs, and the chance to become advocates in their chosen area of expertise. The organization recently celebrated its 100th anniversary.